Amman, July 23, 2017 – Optimiza announced today it has achieved Cisco® Gold Certification. Optimiza, the leading publicly-listed regional ICT systems integrator (ASE:CEBC), has met all requirements for achieving Gold Certification, including personnel, support, specialization and Hybrid IT. 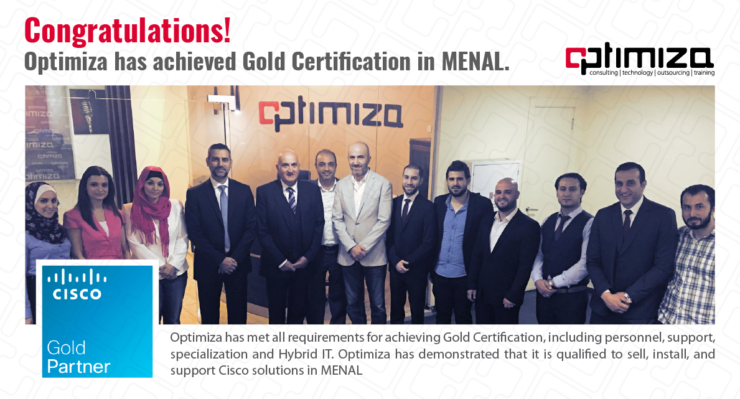 Optimiza has demonstrated that it is qualified to sell, install, and support Cisco solutions in MENAL. “Optimiza was granted this title following an audit of knowledge and processes, and it is verified annually through an extensive onsite audit” said Majed Sifri, CEO of Optimiza.“it reflects our ongoing commitment to continuously provide our clients with the highest levels of service with an intense focus on quality and value”. Cisco Gold Certified Partner is the highest title Cisco awards its business partners for the level of expertise and services achieved. Gold Certified Partners are recognized for having some of the industry’s best-trained network engineers and demonstrating the highest level of expertise in planning, designing, implementing and supporting complex networking solutions.